Cheltenham opened up a four-point lead at the top of the National League as they earned a fourth consecutive win by beating in-form Kidderminster. Daniel Wright opened the scoring for the hosts as he sliced home a penalty following a handball from Tyrone Williams shortly after the break. James Rowe then teed up Dan Holman, who slotted home from the edge of the six-yard box to ensure victory. It ended a recent revival by Harriers, who are nine points adrift of safety. Match ends, Cheltenham Town 2, Kidderminster Harriers 0. Second Half ends, Cheltenham Town 2, Kidderminster Harriers 0. Attempt missed. Kelvin Langmead (Kidderminster Harriers) header from the centre of the box is too high. Assisted by Ben Whitfield. Attempt saved. Harry White (Kidderminster Harriers) right footed shot from outside the box is saved. Attempt missed. Billy Waters (Cheltenham Town) right footed shot from the right side of the box misses to the right. Substitution, Cheltenham Town. Jack Munns replaces James Rowe. Substitution, Cheltenham Town. Jordan Cranston replaces Asa Hall. Substitution, Kidderminster Harriers. Evan Garnett replaces Zaine Francis-Angol. Goal! 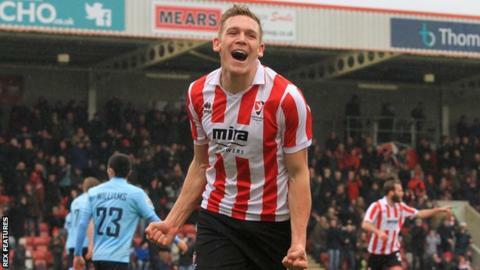 Cheltenham Town 2, Kidderminster Harriers 0. Dan Holman (Cheltenham Town) right footed shot from the right side of the six yard box to the centre of the goal. Assisted by James Rowe with a cross. Hand ball by Ben Whitfield (Kidderminster Harriers). Goal! Cheltenham Town 1, Kidderminster Harriers 0. Daniel Wright (Cheltenham Town) converts the penalty with a right footed shot to the bottom right corner. Penalty conceded by Tyrone Williams (Kidderminster Harriers) with a hand ball in the penalty area. Second Half begins Cheltenham Town 0, Kidderminster Harriers 0. First Half ends, Cheltenham Town 0, Kidderminster Harriers 0. Attempt saved. Arthur Gnahoua (Kidderminster Harriers) right footed shot from outside the box is saved.